Obviously it is Sunday. It's a lazy day, whether spent watching your favorite movie for the twentieth time (What Betsy and I used to do at good old Randolph Macon Women's College. It was Mean Girls at the time) or writing a paper. I truly believe Sunday is the most important day in that it sets the mood for the rest of the week. I spent a lot of Sundays around the world. Many of which I don't really remember. But one thing I do know for sure; everyone spends their lazy day in a different way. I recall the ritual of Sunday brunch in Manhattan. It seemed everyone did it. We would go to a wonderful little bistro of some sort, most likely on Madison. Enjoy small salads and smoked salmon. I miss those days. 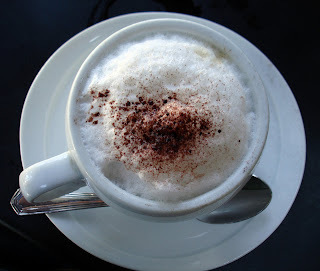 There was no such thing as a Sunday brunch without the world's greatest cup of cappuccino in Switzerland. I dream of that foam touching my upper lip these days. Starbucks never comes close to duplicating that cup of bliss, or the ambiance that went along with it. Sitting on the corner with a clear view of the alps; I never appreciated it enough. The most important thing I have learned, Sunday is a day to meditate. That does not mean sleep all day. Get up and work out, finish that paper, have brunch with loved ones. Get your body, mind and soul ready for the week to come. A Sunday spent well is a happy Monday morning.